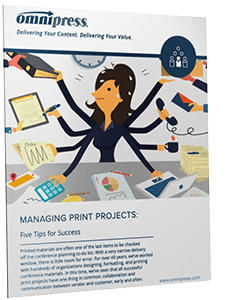 Learn Five Essential Tips That Will Help You Manage Your Next Conference-Printing Project. Printed materials are often one of the last items to be checked off the conference planning to-do list. With a very narrow delivery window, there is little room for error. What steps can you take to streamline your next print project, avoid common pitfalls, and increase the return on your investment? Which other tasks can a vendor take off my list? Why is it important to let the goal of my project determine the format?